Pleysante: fully independent bright accommodation in a villa under pines and 8 minutes on foot from the beach with private entrance on a quiet avenue, secured courtyard surrounded by trees, covered shelter for a car in the courtyard, full air-conditioning with purifier filters, barbecue/plancha, terrace equipped with folding awning for dining area, another terrace with another dining area, another terrace with cosy garden furniture, kitchen (dishwasher, microwave, traditional oven, ceramic hob, small necessary household appliances (coffee machine, toaster, kettle and pressure cooker)), small laundry room with washing machine, tumble dryer and iron, living room with 2 sofa-beds (in case of visit), television, desk with Wi-Fi, dining area and 2 bedrooms on the garden level including 1 with large bed and television and 1 with 3 single beds (bunk beds and single bed). We can add a folding cot and a high chair for a baby upon request. The owner welcomes you and is at your disposal for any information during your entire stay. Upon request, before your arrival she can organise sheet and bike rental, the enrolment in one of the best surfing school 500 m away (10 % discount for our guests for these bookings), many activities and strolls 500 m from the very sought after golf course of Seignosse. 1 h from Hossegor and Capbreton, 25 km from Bayonne and Dax, 35 km from Biarritz and 45 km from Spain, we offer a tourist accommodation from the end of October to the end of April 2016. This is the opportunity to spend the winter in our beautiful temperate region. The monthly rate will be very interesting for 2 people. Economical heating by heating pump. We are at your disposal for any further information. We had a lovely holiday here which was made all the more special by Reine’s warm welcome. 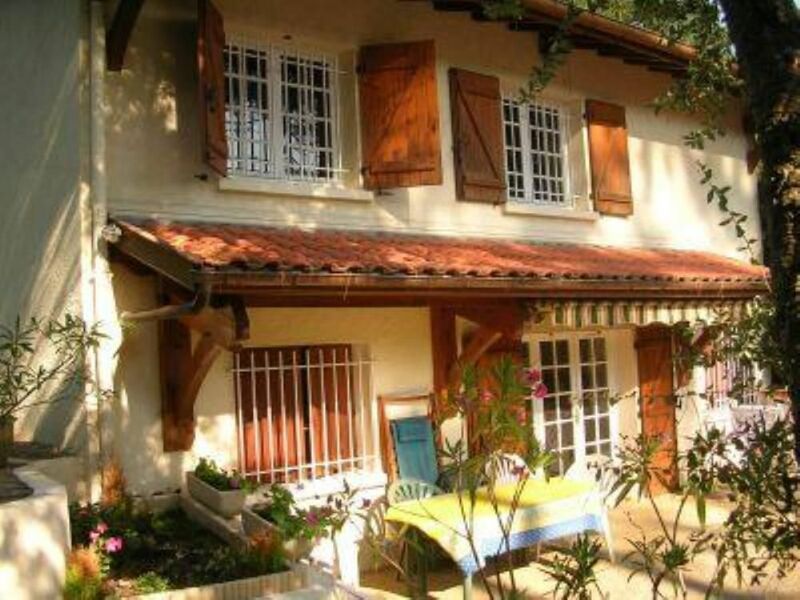 This property is set in an ideal location on a quiet street but within walking distance of the beach and a short cycle to the boulangerie and local mini mart. The apartment is simply furnished with comfortable beds and plenty of storage space for clothes and food (not something you always get). It is well equipped with air conditioning, a dishwasher and washing machine as well as more obvious items such as coffee maker, kettle and toaster. The outdoor space is great for eating and relaxing with plenty of options depending on sun/shade. We had a wonderful time and will definitely be returning. Accueil chaleureux, belle petite maison bien équipée, calme et détente au RV! Lieux adapté à des vacances avec un chien! Casa bella, confortevole e in zona tranquilla. La spiaggia è facilmente raggiungibile. Giardino comodo e attrezzato per pranzi e cene. Sehr herzlicher Empfang durch die Vermieterin, die im Obergeschoss wohnt (dennoch bleibt man völlig ungestört)! Die Nähe zum Strand ist ideal (5 min vom Haus), das Meer für Surfer und größere Kinder ein Traum. Kleine Supermärkte am Ort /auch Wochenmarkt, allerdings 20 Min. zu laufen, zum Großeinkauf Supermarkt in Hossegor (Auto erforderlich). Das Haus liegt an einer ruhigen Strasse inmitten von Pinien, ist gut ausgestattet und bietet genügend Platz für eine fünfköpfige Familie. Sehr erholsame Ferien, gerne wieder!! "petit logement très sympa et bien placé"
From Bordeaux or the airport of Biarritz, motorway exit n°63 in Capbreton follow “Seignosse Le Penon”? From Toulouse or Pau, motorway exit n°64 in Peyrehorade. The owner welcomes you and is at your disposal for any information during your entire stay. Upon request, she can rent sheets and even towels as well as bikes (10 % discount for our guests if they book before arrival).